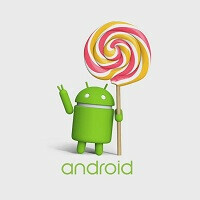 Like anything you read on the internet, always hedge your bets, but chatter on Reddit appears to have confirmed that early 2015 is going to be the beginning of a big push to update a lot of Samsung hardware to Android 5.0 Lollipop. The moderator “verified” Samsung “rep” shared an image of an email providing some broad strokes as to what Samsung employees needed to do to prepare for the updates which will begin in January. The email was lacking in many specifics, and the rep also provided the caveat that there was no hard-and-fast date schedule, and “milestones get missed, variables can go far left.” He did reiterate however, that if the higher-ups felt confident enough to send out this information about how to prepare retail units, then updates will be coming soon. Now we must also provide the caveat that “SES,” as referenced in the email, means Samsung Experience Store, as in what one might find in a Best Buy store. Because of that, this indirect channel communication may not be totally dialed in with what Samsung is planning. Then again, retail instructions like this are not generally outlined unless there is some expected action coming down the line. Let us grab that pinch of salt, and delve further into speculation. The rep shared that Samsung Galaxy S5 is the priority to get Android 5.0. That will be followed by the Galaxy Note 4, then the Note Edge. After those three, other models, including the Galaxy S4 and Note 3, will be next in line. Posts in the Reddit feed have since been heavily edited, so we will grab even more salt and throw in what used to be on the page. The rep noted that while he did not have any specific carrier timelines for an update, he was told that Samsung has been weighing heavily on the carriers to move updates out faster. We do not know how effective that pressure will be on the part of Samsung. The US carriers are not known to be the fastest at letting the updates flow at-will (not counting Apple). 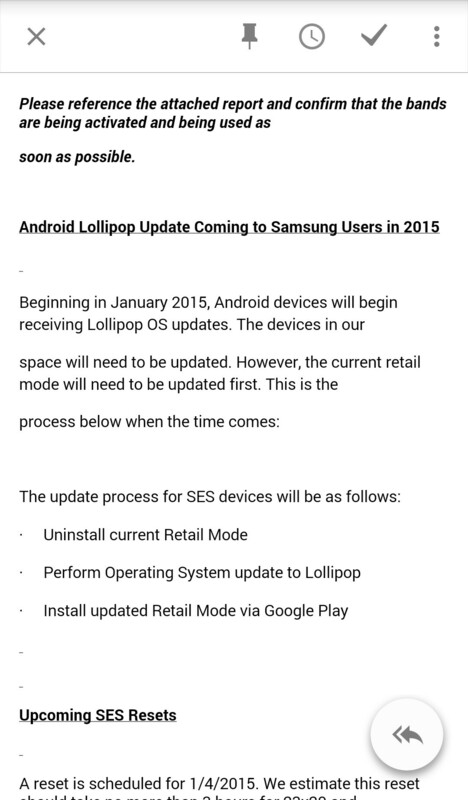 The Lollipop update has already started for the Galaxy S5 in a few markets. This latest news only reaffirms update information we have seen for Samsung’s late model devices. Something that sammy needs to do. Something EVERYONE needs to do. Nobody gonna tell US carrier's what to do. Nice try Sammy. Apple did and guess what happened? Yup. Apple has loyal customers and a strong ecosystem that cannot be manipulated. Samsung is a different case. 'apple is different' is basically what you are saying, but no they aren't really the only real difference is that they are an american country and that apparently makes it ok for them to get their way, but the moment non american companies tries to do stuff like this to benefit their customers, the response from the american companies is: "You can't tell us what to do!" ??? Someone needs to pressure Motorola to update the 2013 Moto X. I'm getting freakin tired of waiting. Moto is clearly being influenced by Lenovo more and more everyday. Come oooon, update Moto X 2013!!!! You always have choices. If you want a subsidized phone than you have to accept the bloatware. If you don't like that buy a full price unlocked phone. Practically US have a good price policy for subsidized phones and for the rest of the world just not worth it. Yes, you are correct. However, unlocked devices, your stuck with either AT&T or T-Mobile. The rest are just a bunch of MVNO want to be. I took a Verizon Motorola Droid Maxx (~yr old) to T-Mobile, changed the APN's and had no issues. Must be a slow day for something like this to be considered news. Seems like you aren't having a pretty great day yourself since PA got you to click and comment on this article. I do wish the OEMs had more control over when updates are released in the US. I'm sure we'll get there eventually, but it may take a few years. Luv my oldie but goodie Nexus 4 (5.0.1)!